You know that scene from Sofia Coppola’s Marie Antoinette where the Queen and her entourage attend the masked ball in Paris? I’ve always wanted to go to a masked ball like that, in Paris. Anyone care to join me? Hope your Halloween is full of quirky disguises and sweet delights! See more of the Modern Meets Marie bridal shoot. Since this shoot was just featured yesterday on Wedding Obsession, I thought it would be fun to show a couple of shots from behind the scenes that day. I had an army of Whittakers helping (2 under the age of 10) and there were more than a few photo bombs. When you’re related to the culprits, you can’t help but smile. Samantha the bride, vamping/hamming it up. Now if I just had a photo of the cat licking the wedding cake, this post would be complete. On a wintery day in Calgary, it’s a special treat to have my summery, pink inspiration shoot featured on Wedding Obsession. Melissa’s blog is chalk full of beautiful wedding ideas and it’s published right here in Alberta. Pop over and check it out. Last night I had the pleasure of covering the Fashion Calgary Portrait Campaign Gala at Eighth Avenue Place. It was an evening of culture, great food, art, music and complete, Calgary glamor. Here’s a snippet from the evening. Chef Michael Noble of Notable Restaurant. I had more than my share of the blue cheese cheesecake. And the couple behind the whole event, Ania Basak & Rafal Wegiel. Kudos to you on behalf of our city! Happy Tuesday everyone! I am completely loving these beautiful brogues from Urban Outfitters. They would perfect for wedding with a bohemian feel – maybe for bridesmaids, flower girls or for the bride to dance the night away in. Or for their photographer…..
It’s always fun to see what your clients do with their images after you take them. I love seeing photos of their new living room, decorated with canvas wraps of wedding images or when their photo Christmas card arrives in the mail. Imagine my delight to see Kari & Derek’s creative save the date ideas all set to be mailed out. 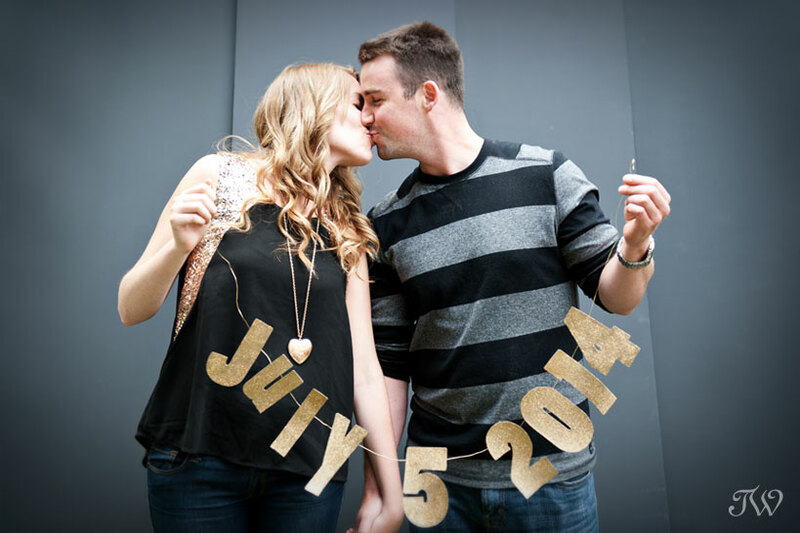 Along with their Gatsby-inspired engagement session, Kari planned a few shots specifically for her save the dates. Here’s an Instagram photo of her wedding stationery. As you can see, Kari loves a little sparkle and it shows. Well done Kari & Derek.